Each box contains 16 packs. Each pack contains 7 cards. 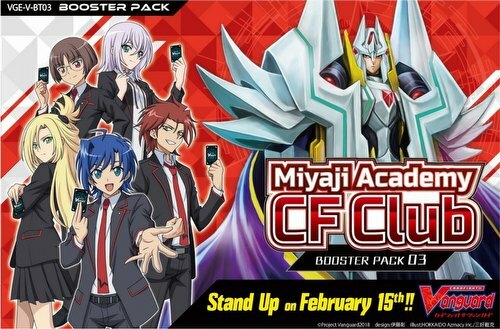 The Miyaji Academy CF Club can strengthen the Oracle Think Tank clan's Trial Deck Vol.05 Misaki Tokura and the Narukami clan's Trial Deck Vol.06 Naoki Ishida. Nubatama decks can be constructed with just this booster. Blaster Blade will get a special reissue with SP treatment! There is an increased number of VRs in this set and the insertion rate is increased as well. Featured clans include Oracle Think Tank, Narukami, Royal Paladin, Nubatama, and Gold Paladin. 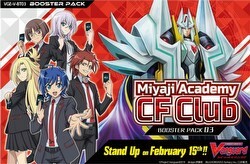 Each box contains 16 packs with 7 random cards per pack (including 2 that are Rare or better). There are 84 different cards in the set (all new) - 5 VR, 8 RRR, 12 RR, 17 R, and 42 C, plus 5 SCR (5 Parallel), 6 OR (6 Parallel), Image Ride Rare (2 Parallel), 1 Special Reissue, and 5 SCR.